For a birthday gift that provides total enjoyment for the recipient, this collection of fresh-baked cookies in a festive birthday bucket is always an impressive choice. Vanilla Sprinkle, Double Chocolate Cookies. Cranberry Oatmeal and Chocolate Chunk Cookies . Each gourmet cookie is individually wrapped for freshness, and accentuated with a hand-tied satin ribbon with optional personalization. A free card with your personal message or greeting is included, as well as complimentary scissors so your recipient can easily open their gift. Your gift will leave a lasting impression as they repurpose this fun and festive Birthday party pail at the beach, playground or even as a planter! Measures 12" x 8" x 8". Happy Birthday Cookie Pail is a hand delivered gift. These gifts are delivered by one of our local design centers located throughout the United States and Canada. Same day delivery is available for most gifts when ordered before the cutoff time. The cutoff time for Happy Birthday Cookie Pail is 2 PM in the recipient's time zone. Fresh baked gourmet cookies in classic flavors. Vanilla sprinkle, chocolate chunk, and more. Birthday party-themed pail and party horns. My grandson was happy with his gift and enjoyed every cookie. Most importantly the gift was delivered on time as promised. I sent a cookie bucket to my son for his birthday. He sent me a picture of the cookies after he received them with his thanks, and the gift was accurately portrayed on the website. He said the cookies were good. The online ordering was very user friendly. Confirmation of the order was almost immediate. However, the best part of this website is their tracking system to ensure the order arrived as requested. I paid for next day delivery for arrival at his office on his birthday. I knew exactly when the order was delivered without connecting to an additional website. I order a great deal online, and when a company has a quality product and a well-designed website, it is easy to recommend its use. I ordered 2 of these for my goddaughters who have birthdays within a few days of each other. I wasn't sure if they would be delicious or if they would be dry. Turns out they are, "to die for" says the goddaughters! A hit! Yay! I sent this gift to my boyfriend for his birthday and it was great! He loved the cookies! Sent this to my best friend as a surprise for her birthday. It arrived when they said it would. She said the sprinkle cookies were big & the others were a good size. Overall she was pleased & said the cookies were good. This is the second time I have ordered from The Gift Tree. I will use this company again. Prices are reasonable & delivery is quick. The cookies I ordered were amazing. My sister and cousin loved them. GiftTree delivered them on time and the presentation was great. Last minute, sickness made it impossible to celebrate a family birthday. Two days before it, I found Gift Tree and had this delivered. She was so so happy, and so are We! THANK YOU, and wonderful customer service! I ordered this for my sister on her 18th birthday and she was totally satisfied and overly joyed upon receiving it. The delivery was made just when I was hoping it would. Thank you GiftTree! The Cookie Pail was great. It was well accepted by the recipient. Wish I could have added a Stuffed Bear to go with it. I'm very happy with the presentations of the products and the delivery time. Products arrived timely, to Texas and Woodland Ca no problems. I will definitely order again. Thank you! This was sent to NY to my mother who turned 86 that day...she was thrilled with her little gift and said the cookies are delicious...She has been sharing them with visitors. Thank you for handling this so quickly and making her day. Had this delivered to my grandson as a surprise for his 18th birthday because we couldn't be there in person until later. He absolutely loved it and said the cookies were delicious. He thought it was such a nice thing to do. Easy to send and delivered right on time. My Mom totally loved her Happy Birthday Cookie Pail. It arrived right on time (as promised) and those HUGE(!!) cookies were really delicious! A unique and festive presentation. Thanks! This gift was purchased for my daughter-in-law's birthday and was delivered late. She did like the cookie pail and said the cookies were very good. I sent this gift to my daughter who is a freshman in college and she loved it! She said the cookies were delicious and trust me, she can be a tough critic when it comes to sweets! We were not able to actually see this gift ourselves, and our grand-daughter, who was the recipient, said it came in a box so she hadn't unwrapped it and seen it yet, so we don't know yet if it looks like or if the cookies taste good, but she was glad to get them. They came in time for her birthday so that was nice. Great Birthday Gift for my Mom! She LOVES cookies! So, this was a perfect gift for her. She really loved the presentation and the cookies. Thanks for getting them there on-time for her special day! Ordered this from the UK for my daughter at UNC and it was delivered exactly as promised and I was told the cookies were lovely. The complimentary scissors was a nice touch too. I would definitely recommend. This was a gift for my daughter. Wanted to do something different. It was delivered to her work and she and everyone else loved it and thought it was great! We sent this to our daughter in college in New Jersey from Australia. She loved it and said the cookies were amazing. Glad that she was so happy. Order was delivered on her birthday. The Happy Birthday Cookie Pail was delivered on time, delivered just exactly as ordered, and pictured, and a pure delight for the "Birthday Boy". I will definitely order from Gift Tree in the near future! Very unique gift. A superior option to sending flowers for a birthday especially when it is a male. It was well received and had exceptional reviews from the recipient. Only wish balloons could have been sent as an attachment rather than having to order them separately. Perhaps something to explore in the future. Fiance loved it a lot! This was a great gift for my daughter who was away at college for her birthday. She was pleasantly surprised and totally enjoyed the cookies. The delivery was quick and very efficient. I will definitely use Gift Tree again. Our son who is in boarding school loved this surprise on his birthday. The cookie pail was perfect...my husband LOVED IT! The recipient couldn't have been more pleased or surprised with her cookie basket. She loved that the cookies were all individually wrapped. Everything arrived in good condition on the inside of the package. It was beautifully decorated. She could not wait to open it. This cookie basket was a big hit for the person that received it! Was delivered on time and the cookies were great. My granddaughter loved the gift. Two years in a row now, Gifttree.com, has given us a great gift! I will definitely order more often. They were even nice enough to call me and email me a promo code. Now who does that? I'm not good with computers so actually never got code entered. Maybe next time. A rating! Daughter in law was delighted and surprised. She seemed pleased to get it. Thank you. I ordered this for my Sister's birthday and my granddaughters gave this to their Mom for her birthday. Both were very happy with the presentation of the cookie bucket. The gifts were delivered to them on their birthdays. Ordering is easy and I found GiftTree to be very accommodating. Will definitely order from GiftTree again! I sent this gift to my brother for his birthday. He loved the sugar cookies and the chocolate chip cookies but said the molasses cookies were a little dry. I'm sure he ate them. He doesn't pass up much when it comes to sweets. I would definitely order again. Cookie Basket. Granddaughter called it cute. It arrived on her birthday but I haven't heard, as of now, if the cookies were good or not. But they sure looked good to me. I would order from your company in the future. 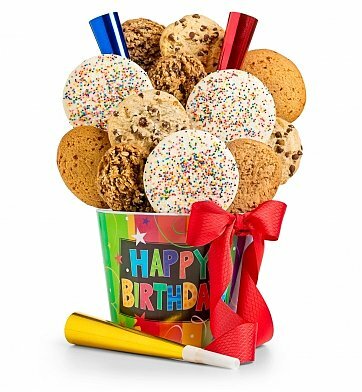 I ordered this happy birthday cookie bucket online to be delivered to my sisters work for her birthday. The ordering process was extremely user friendly. I also received up-to-date updates on the status of my order and also received an email confirmation when the gift had been delivered. My sister was extremely surprised and happy with the product. THANK YOU! Thank you for being so prompt. My granddaughter loved it. This was a gift to my best friend and she really liked it. She received it on her birthday and I was happy because she was happy. The customer service representative was very nice and professional while taking my order. I will order from GiftTree again in the future. Keep up the good work. I travel a lot and GiftTree makes it easy to find special gifts for my family and friends. They always arrive on time and everyone who receives them LOVE the presentation. I ordered the Happy Birthday Cookie Bucket for my son to send to him on the occasion of his 18th birthday. He received the gift on the scheduled delivery date and absolutely loved the cookies. The shopping and delivery experience was wonderful - too easy. However, the only issue I had was that my son's birthday was on Sunday 16 November and the only dates available (offered) to send the cookies was either Thurs 13 Nov or Mon 17 Nov. I would have preferred to have the cookies delivered on Friday or Saturday ??? closer to his actual birthday but this did not seem to be an option. ??? Other than the delivery date all was outstanding. Thank you for helping me make sure my son felt special on his milestone birthday while I am deployed. I will definitely be ordering with you in the future. GiftTree will be my go to internet gift shop. Basket was delivered on time as promised and my niece was quite impressed. You guys took care of her. Love this business. It is great! The recipient was very pleased with the presentation & wrapping of the gift. I was informed the cookies were"awesome". Thank you for making a birthday special! Delivered exactly on the day I requested it (my daughters birthday). It was so perfect my grandkids want Nana to send them a "Bucket of Birthday Cookies" on their birthdays! The cookies were large and very fresh & very good! Thank you, Thank you, Thank you! Cookies were fresh and soft - nicely arranged! Once again you have delivered as promised and the gift was well-received. I understand the cookies were delicious. Thanks again. This was for a toddler who said the cookies were yummy! I ordered the item and it was received in 2 days. I sent the birthday cookie bucket to my son for his birthday and he was thrilled! Said the cookies were huge and delicious. I opted for the regular shipping option and it arrived exactly on the date expected. Very pleased and would order again! I must say I will give you business in the future! Thank you for making my gift to my sister so far away very special. The order was on time, and very delicious! You have a wonderful company and deserve my business. I ordered this about 5 days early for my boyfriends birthday. I was worried it would arrive way too early and not be as special since it wouldn't be his actual bday... but nope! Arrived perfectly on time on the date I selected for it to arrive. My sister loved this special treat. She said it brighten up her day. I love the idea that the cookies are all wrapped individually to keep them fresh for when they arrive. Love the Bright color of the bucket as well. I sent this to my sister and she was thrilled. This was my first time ordering from GiftTree and I was amazed at how quickly it shipped, even got there a day sooner than promised. I will definitely use this company again. Thank you! I sent this to my 91 year old mother who lives in another state and she just loved it. She said the cookies were delicious. I have sent many of your towers to my mom and she loves when she gets something from your company. With a reasonable price and nice assortment of cookies, I think it makes for a nice and modest birthday gift. We ordered this cookie bucket for our son's birthday since he lives so far away and we couldn't bake a cake. He loved all the different kinds and they arrived at the perfect time. I purchased this Birthday Bucket as well as another item for my best friend's Birthday last week. He LOVED it! I did not have any trouble getting these items delivered on time. The company also called to assure me that my delivery was on its way and I was very happy to have seen my friends reaction to these items. I will definitely be placing more orders in the near future. I am told the cookies are delicious and plentiful - the presentation is lovely and festive - thank you! Thank you so much for helping me celebrate my son's first birthday away from home (at college). Your delivery was prompt and your email status updates were greatly appreciated. Your cookies are a big hit! Granddaughter and her young son said they enjoyed it. Surprised my 20 year old at college with this bucket of cookies. She loved it, said the cookies were delicious and that the specially printed ribbon was awesome. Love that the cookies are individually wrapped. Beautiful presentation. I got what I paid for and I loved it!!! Very cute little bucket of cookies. Was for my Grandma and she absolutely loved it. I was expecting it to be small but it turned out to be a great size! I personally didn't see it, but I was told it the cookies were very good as well as very big. I also assumed the bucket was just paper not so, it was metal so reusable. I did go the extra mile and get the bow printed which I think pulled it all together. Either way this is a very nice gift at a very reasonable price. Will be sending this again!!! I personally didn't see it but I did receive a picture from the person I sent it to. I also was told the cookies were quite good. I will defiantly be sending this one again it was a hit! Wonderful service and product!!!! Delivered the next day to Hillsboro to wish my transplanted Buckeye a Happy Birthday ! He said the cookies were "tasty"!!! Sent this to my nephews. They loved it! It was sent in a timely fashion, was well packaged and the cookies tasted fantastic! A great product and value! Was surprised by how fast it shipped. Only took 2 days! Great birthday gift. My friend loved it! This was my first purchase and the recipient was extremely pleased. I was fortunate enough to be given one of the cookies and it was really good. I'll definitely be buying from here again. I didn't see the gift but the recipient said it was lovely! Great service- will definitely order from you in the future. My Boss received it on time for his Birthday, he LOVED it. Thanks to your customer services. You went extra mile to make it happened. I don't really choose GiftTree in the past, but from now on you will get a lot more order from me, because I know you will make it happen no matter what to make sure your customers are satisfy and happy. Thanks again. 10 year old girl was thrilled with this gift! This was a gift for my mom who lives in another state. She said that it was really cute and the cookies were good. Only complaint is that several cookies were broken but I imagine that happened during delivery. I sent this bucket for my daughter's birthday and she loved it. The noise makers added to the festivities and the cookies were delicious. I appreciated being informed all the time re the delivery through e-mails and it was delivered as prromised. My granddaughter's birthday was September 23rd, however the gift I ordered arrived the 26th. She really enjoyed the cookies and said they were delicious, but I was disappointed in the delay. I would definitely use your gifts over the website again because I have before and everything went well then. Thank you. My granddaughter said it was great! I cannot give an opinion as I did not see the Happy Birthday Cookie Bucket other than the picture you are showing now. Looks lovely and my granddaughter who received it loved it. Thank you so much for the wonderful service provided. The recepient was extremely surprised & happy. Your service delivered as stated which is a highly valuable asset to any establishment. I plan on using Gift Tree on future purposes. THANKS!!! I sent this gift to my great nephew who turned 3 in Illinois. He was so excited like was Christmas!!!!!! They said the cookies were very good. I sent this to my mom for her birthday. She loved the presentation (especially the party horns), and she said each of the cookies was incredibly fresh, chewy and delicious. This gift is a great value for the price! Made the Birthday girl very happy! Everyone was thrilled and happy to get the gift! I ordered this gift for a friend's birthday. She (and her family) loved it!! I sent these cookies to my 10 year old niece for her birthday. She liked them and told me that her brothers want me to send them some now! She loved everything about the gift. This is the second time I have sent this gift. The 1st time was to my son in law. I bought this as a birthday present for my grandmother. It was delivered quickly and everyone who was there when she opened it said that it was a party in a bucket. The cookies were large and very tasty. Overall, it was a hit. OMG! My son enjoyed his Cookie Bucket. I thought since he was in college he wouldnt like it. It was a hit with him and his room mates. He wanted more cookies. Looking now to see if I can order more cookies for him. I will order again!!! This was a hit!! I bought this gift for my husband and he loved it. From the freshness of the cookies, to the delivery of the birthday cookie package everything was top notch. I will use this company for future purchases. Sent this gift to my stepson at college for his birthday. It was delivered right on time. He said the cookies were soft and really good tasting! Very pleased! Great gift to purchase. It arrived on time as promised an the person I sent it to loved it. Gift tree is my new to to for long distance gifts. Sent this to my grandaughter. She called to tell me how pretty it was on the day it arrived. I spoke to her mother a few days later and she said the cookies were "really good" and they had all enjoyed them. Sent this to my grandaughter. She called when it arrived a few days before her birthday and told me how pretty it was. After her birthday I spoke with her mom and asked for an honest opinion of the quality of the cookies. She said they were "really good" and that the whole family had enjoyed them. Wonderful gift for a 9 year old. delivered on time, well presented. would recommend to all my friends and family. I got this delivered to my husbands office for his birthday and he loved it! The cookies were pretty tastie considering they were prepackaged, they certainly didn't last long! All in all and beautiful display and my husband loved getting a special delivery! Sent this to my daughter who is in the Navy. It was delivered on time and she said the presentation was beautiful. She especially liked the way it fanned out when she removed the wrapping. She also said the cookies were delicious. I sent this to my best friend for her birthday and she says, "The cookies are very good!" Very nice bucket and good cookies! My friend was over the moon with his gift and stated that it looked brilliant. I was very happy with the overall easiness of placing the order and the regular emails enquiring if I was satisfied. I will be using Gift Tree again. My friend in the ARMY stationed at Ft. Bragg was in training when they arrived for him at the FT Bragg Post office and even though they were delivered on time and perfectly, he wasn't able to recieve them until 2 weeks later because of his special training in the field. I was worried they would expire but he assured me when he picked them up that they were all perfectly wrapped and preserved in sealed wraps so that they would stay fresh for many weeks. He and his roomie at camp loved them! My nephew enjoyed it ! He liked it and was happy. It was a lovely way to put a smile on my brother's face. The cookies are so fresh and delicious! The cookies in this gift are some of the best cookies I've ever had! They are individually wrapped and it shows! The freshness is amazing, it's like they just came out of the oven! And after reading up about them online, it turns out they don't have all that added preservative junk! Two thumbs up!